The Bath Salt Zombies are a central Florida band whose performances are an entertaining mix of originals and covers that has been described as hoodoo grass. Their unique sound is created by Graham Woodard—rhythm guitar, mandolin and vocals, Zane Bowman—banjo, guitar, theremin and vocals, Dan Croley—percussion and vocals and Tucker Cobb—bass and vocals. The group came together in the fall of 2012. They played more than 100 shows the following year, including several festivals in and around Florida. Some of the stops were Orlando, St. Pete, Tampa, Vero Beach, Melbourne, Live Oak, Jacksonville, St. Augustine and Ft. Lauderdale. Festivals included the Orange Blossom Jamboree in Brooksville and Bamboo Jamboo in DeLeon Springs, both in Florida. In 2014 they came into their own as a Florida favorite with the February release of their first CD, “Hairy Women and Farm Animals EP”. This was also the year for their first national tour organized around attending the Muddy Roots Festival in Cookeville, Tennessee. This late summer circuit included 16 dates in three weeks in eight states from Georgia to Ohio to Illinois. 2014 also saw BSZ develop shows featuring innovative use of black light reactive props, costumes and makeup. Their award-winning, themed festival campsite stage efforts feature UV art, as well as stage and prop design and engineering done by the band and the BSZ Production Crew. Themes presented so far are: “Zombies in Space” at Orange Blossom Jamboree in 2014 which won 2nd place for best campsite, “Electric Zombieland” at Gov Fest 2015, and “Zombies of the Deep” at OBJ in 2015 where they came in first for best electric campsite, “Electric Zombieland 2” at the Pass the Good Festival in Pensacola at the end of July 2015, and “Cirque Du Zombé” at Orange Blossom Jamboree in 2016. 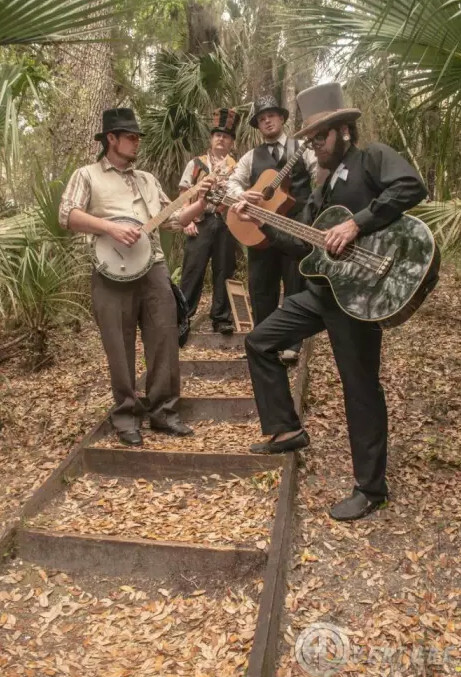 BSZ’s theatrics and refreshingly different approach to music with folk roots gained them an invitation to perform at WMNF’s 34th Annual Tropical Heatwave Festival in Tampa in May of 2015. July 18th, 2015 saw the release of their first full-length CD, “Six Feet Under the Big Top” marking the start of this summer’s national tour with over a month of dates in Florida, Kentucky, Pennsylvania, Ohio, Indiana, Illinois and Wisconsin, then back to Florida for a final week on both coasts. Highlights on this tour were the Terrapin Hill Family Reunion Music Festival in Kentucky and several dates with other touring bands including the Rumpke Mountain Boys, the Madpolecats, Daysleeper and the Josh Daniel/Mark Schimick Project. The Bath Salt Zombies also combined forces with Randy “Noodles” Day of The Elephant Project in 2015. Noodles helped take their innovative black light show to the next level as their dedicated lighting designer. The band began touring with Glostik Willy (IN) and Opposite Box (TN) in the remainder of 2015 and throughout 2016. BSZ completed their longest tour to date in April and May 2016. It was 40 days and covered 21 states. They followed up with a 34 day tour two months later. The Zombies are set to release their second studio album, a covers album titled “Embezzled and Butchered Ballads” on October 21st, 2016 and they are set to reach their goal of 200 shows for the year. Plans for 2017 include touring the US with Buffo’s Wake (from England), more music festivals and more dates with Glostik Willy, Opposite Box and The Madpolecats. A second originals LP is in the works and should be completed in the first half of 2017. The band will tour Europe with Buffo’s Wake in the second quarter of 2018. Gypsy punk lunatics with a taste for the macabre. Festival veterans, regularly appearing at some of the UK’s biggest festivals, including Glastonbury (2013), Bestival (2013) Secret Garden Party (2011 – 2013) and Boomtown (2011 – 2013), as well as live performances on BBC Introducing, Buffos Wake will grab you, and leave you dancing like a man possessed. Guaranteed to raise hell!